New Delhi: Five International records, 300 awards including 40 international, and chairing 54 social, cultural and media organization proves Sandeep Marwahâ€™s involvement and deep interest in promoting art and culture of India. Recently Sandeep Marwah has been nominated as World Peace Ambassador and Global Cultural Minister in different Global Summits. 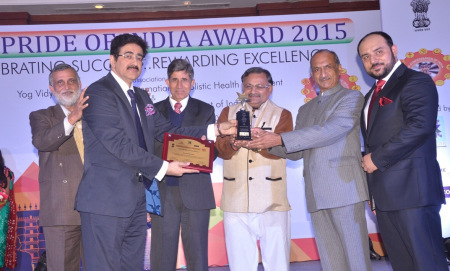 The Pride of India Award 2015 goes to Sandeep Marwah for his untiring contribution towards promoting and developing art and culture, media and entertainment and education. Former member Parliament J.P. Aggarwal and Pradeep Gandhi, Minister in Bihar Government, Chandra Shekhar, Justice Supre Court of India S.L.Bhayana presented the award to Marwah at a glittering function at Hotel Oberai, New Delhi.